Unsticking the Lavendilly Chi for 2011 ! 2011 has begun with progress already… the Chi is certainly flowing at Lavendilly House. Last week I moved the furniture in our living room and I swear, ever since it feels like a whole lot of stuck energy has been swirling around and around and stirring up some action. I’ve cleaned out my filing cabinet (wow was that ever a graveyard! ), so now that means I can file the papers on my desk and actually find them again! I’ve sorted through the children’s clothes (again! ), de-moulding their bedroom after our recent downpour. I’ve reorganised their playroom in such a way that nobody can RUN through it anymore!! My husband is out on a tip-run at the moment, and cleaning out our garage. He and the kids have started painting the cubby house bits and will put that together again soon. I’ve sorted out my craft space (no mean feat), which required a late night trip to Ikea to buy new shelving. New shelves means that I have had to sort through my craft paraphernalia and now I can actually open the door in there! With the door open the energy is swirling about in there, inspiring me even more. and after getting all my craft stuff out (and after it was sorted and cleaned up again) I began making a patchwork quilt for my daughter’s bed and almost saw the new year in sewing. The time seems to be quite auspicious for sewing such a major project so I am going for it until it is finished – lest it ends up as many other great ideas of mine: folded up and packed away for another auspicious time ….. I am nearly finished and am determined it will be on my daughter’s bed by tomorrow night! The children have been really helpful in their own way, now they are starting to look for jobs to do around the house (I’m pretty certain it is just a phase, but one I am enjoying!) 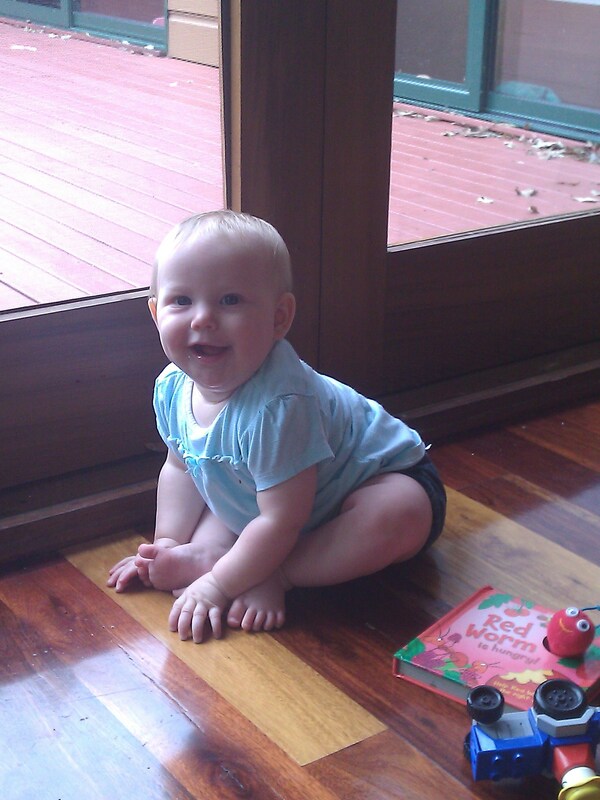 and Baby has been doing plenty of work of her own: her first achievement for 2011 was sitting up for the first time. She’s been moving about for about a month now, commando crawling her way around, but now she’s up on all fours doing a bit of praying mantis swaying and spending lots of time perfecting her yoga stretches to strengthen those muscles. She’s been doing plenty of growing too – five months old and in size 1 clothing already! My eldest was in some size ones still when he was 3 years old, so sadly I have started putting away her baby gear, her bunny rugs, her sweet little bonnets (she has a bigger one for next winter!). Here she is, demonstrating her default emotional state of being: happy and very proud of herself. We need to clean up as well. Time will tell when that will happen. Linden looks a bit like Michael when he was that age and like Michael she is such a happy baby. Please post a photo of the playroom ! Mum, it was simply a matter of moving the table right into the middle of the room so that traffic has to flow AROUND it, rather than right through the middle of the room! Don’t know why we didn’t think of it before – the children still run but their progress is slowed by the table right in their way. Brilliant Jen….That’s a proper family New Year. Love it. Mine’s similar, although instead of sewing I’m painting and I can own that I have MORE sorting to do, and Joe has MORE tip runs. Any one want a spa? We got one to put in and then the drought came! Never did get round to it, so it remains in our garage, blocking the energy. Happy New Year Jen and family. Thank you Carol. It feels great to be so productive! I will post a picture of the quilt. By necessity I had to stop work this afternoon as the house shut down for naptime!! Wow Jen….your place sounds similar to mine at the moment…fun hey? And Miss Linden looks soooooo much like you!